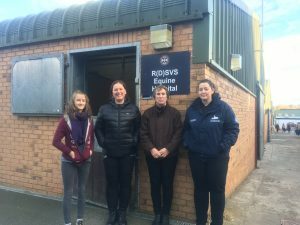 We were delighted to welcome Jean Oudney, Carol Oudney and Erin McIntyre to Moredun to award Jean with the EGSF Heidi Award for Supporter of the Year 2017. 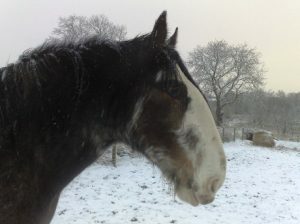 After losing her beloved 4 year old Clydesdale Sykes to grass sickness in 2009 Jean was inspired to do something to help raise money for research. In 2010 the Scottish Grass Sickness Show was born, and has become a much loved annual fixture. 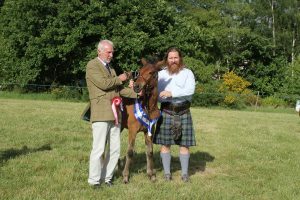 The show takes places on Bogles Field, Blairgowrie on the first Sunday of June and features many showing classes, including a very popular and growing donkey class. For the last couple of years there have also been dressage classes which have also proved extremely popular. Jean has a loyal band of helpers, not to mention competitors who return year after year, and Jean is quick to credit them with the success of the show, saying ‘I have a lump in my throat each year when the entries start to come in filled with so many familiar names. I couldn’t do it without them!’. The show has now been going for 8 years, and in the time has raised the incredible amount of almost £20,000. You can read more about the show here: Scottish Grass Sickness Show or on Facebook. 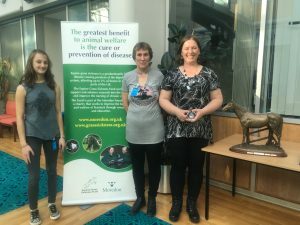 The Heid Award was donated to EGSF in 2015 by the Seath Family in memory of Heidi who succumbed to grass sickness. The award is made to a person who has made an outstanding contribution to the work of the Equine Grass Sickness Fund. Previous winners have been Helene Mauchlen (British Horse Society Scotland) 2015 and Mandy Mitchell (Avon Valley Tidy Memorial Show) 2016.